Despite the words of Dan Mead, CEO of Verizon Wireless, there’s bound to be some concerns about Verizon (s vz) handling the added traffic from iPhone users. It may not be an issue, as my colleague Kevin recently argued, but the question is still crossing people’s minds. One nice way to dispel that could have been if Verizon worked with Apple to get FaceTime running on Verizon’s 3G network. Once the iPhone arrives next month, Verizon users won’t be able to use Apple’s video chat service FaceTime on 3G unless they jailbreak their phone. An Apple spokesperson confirmed that the FaceTime on the Verizon iPhone is Wi-Fi only, just like the AT&T (s t) model. I am still waiting to hear back from Verizon Wireless representatives. Apple CEO, Steve Jobs said at the time of the iPhone 4 release that FaceTime would work over Wi-Fi in 2010 and Apple “needs to work with cellular providers” for video over 3G. It’s now 2011 and we still haven’t heard of any progress on that front and Apple has nothing additional to announce at this time, a spokeswoman told me. This is despite the fact that other providers like Tango and Skype work over 3G on the iPhone. The suspicion for this network limitation is that carriers, namely AT&T but possibly others around the globe, probably balked at FaceTime over 3G for fear of overwhelming their networks. And there is some evidence that FaceTime could be a traffic hog that uses 3 megabytes per minute, even though it apparently works fine in terms of quality. But what about Verizon? Verizon has always touted its superior network reliability, which recently earned it top scores on Consumer Reports rankings. Mead said the carrier advanced its network and built in additional margin in order to support the iPhone 4. The network is Verizon’s strength and why it earns such fierce loyalty from users. And it’s been able to handle millions of data-hungry Android users without any significant issues. If it’s that robust, Facetime over 3G would be a great way to show off just how much better the Verizon network is over AT&T’s. It would also be a selling point to differentiate the iPhone versions, provided AT&T didn’t follow suit. Now there are probably plenty of reasons why Verizon’s may not doing this. It may be that Apple wants to enable 3G support at the same time and needs its carrier partners to all buy in. Or there may be some other restrictions I don’t know about holding things up. Verizon could also be reluctant to enable that right off the bat because it too might be worried about the effect of FaceTime on its network. Perhaps it just wants to focus on launching the device before tackling 3G FaceTime. But as I said Facetime can support 3G and other mobile chat services are doing it. Right now, Verizon’s iPhone is pretty much the same as the AT&T iPhone, with the exception of the Wi-Fi hotspot feature, which appears to be coming to all iPhones eventually. While it is probably more reliable, Verizon’s network is technically slower than AT&T’s and Verizon devices can’t roam overseas with the same ease. And they can’t do simultaneous voice and data calls. So I think it would have been cool if Verizon was first to enable 3G Facetime to show just how confident it was in its network. It might not have bumped sales up that much more but it would be a sign of strength and would show people the full power of the iPhone 4. 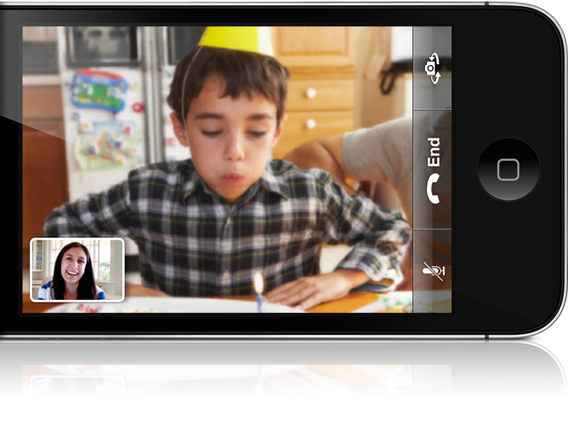 It would also be good for Apple to get this going, especially as mobile video chat providers multiply. Is it “FaceTime” or “Facetime”? The article refers to the technology as each several times. I would think this may come a little further down the line. Sure Verizon has a rather robust network and has had adequate time to prepare for the iPhone but they are probably still a little uncertain. Uncertain of how well the network will handle the iPhone’s high bandwidth demands and uncertain of just how much of a subscriber explosion they are going to see. Give it 6 months to a year and we will probably see FaceTime on 3g, then again by that time there will surely be rumblings if not an announcement of an LTE equipped iPhone. Maybe 4G will handle FaceTime better anyway though.